There's still time! 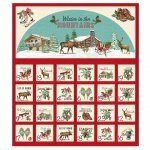 Yes, you can complete this quaint, lodge style, advent calendar in time for Christmas. OK, we know it's a little late to start an advent calendar, but we say just pocket the treats for the first few days and carry on. You'll have a lovely, christmasy project under your needle, with a fire in the fireplace, Christmas carols streaming, and eggnog in your favorite holiday vessel. You won't believe how easy this project is. You just cut out the panel, layer with backing and batting, fold up the bottom of each row of calendar days (accordion style) stitch the folds and bind. The work of a single evening! 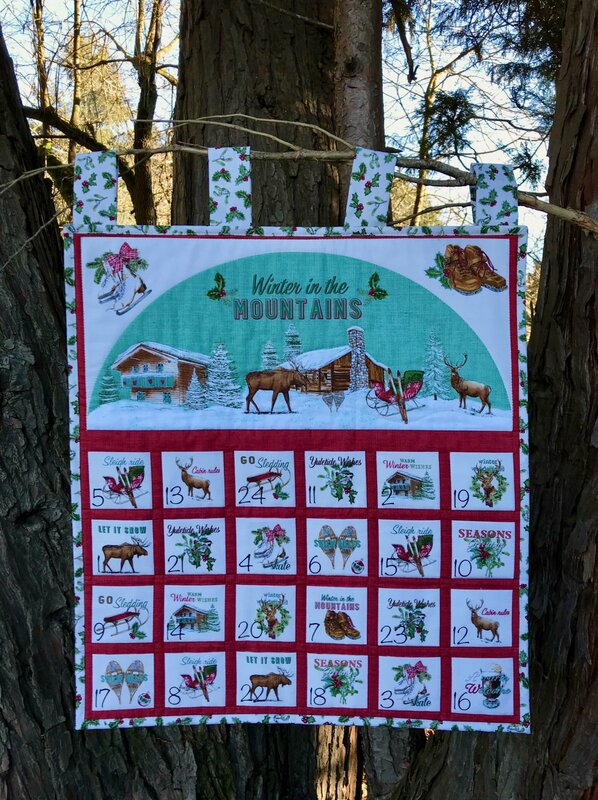 Your kit will include the panel from Northcott's "Spruce Mountain Collection" and enough coordinating fabric for the back, hanging tabs and binding. The backing fabric will be a coordinate from the "Spruce Mountain" collection but may vary from the images shown. The instructions for completing the project are printed right on the panel. Please note a correction to the printed instructions in bold below ... and ... check out a video of the panel construction by clicking below. And ... as a bonus ... the panel contains some nifty, nostalgic gift tags to fuse and use! Cut out Advent Calendar by cutting along the edges of the panel. Create pockets by folding along lines marked “Fold”. Pin or baste and press. Cut backing and batting about 4” larger than calendar (after matching pockets). Layer backing (right side down, then batting, then calendar (right side up). Pin or baste through all layers. Quilt vertical bands, stitching through all layers. Be sure to keep tops of the pockets open for treats. Do NOT quilt pockets. Quilt the top section of the Advent Calendar as desired. Finish edges with binding and add hanging loops if desired.